Dodecatheon meadia of Michigan Flora. This is a handsome prairie and savanna species, barely reaching north and east into Michigan, where it is very rare. Known from a fen in Berrien Co. and a prairie-like strip between highway and railroad in Menominee Co. The Wayne Co. collection is somewhat out of range (Belle Isle in 1896); it has no habitat stated and could conceivably have been planted. 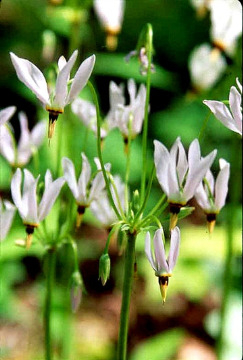 Dodecatheon is clearly a highly modified Primula (Mast & Reveal, 2007), and it seems unlikely that Primula could be subdivided appropriately in order to retain Dodecatheon. Persons who rely on picture-book taxonomy often misidentify cranberry as shooting-star, for both have pink flowers with reflexed lobes and a cone of yellow anthers. In the cranberries the petals are only 4 (rather than 5) and the flowers are at best half the size of those in our shooting-star, apart from the totally different habit of the plants. MICHIGAN FLORA ONLINE. A. A. Reznicek, E. G. Voss, & B. S. Walters. February 2011. University of Michigan. Web. 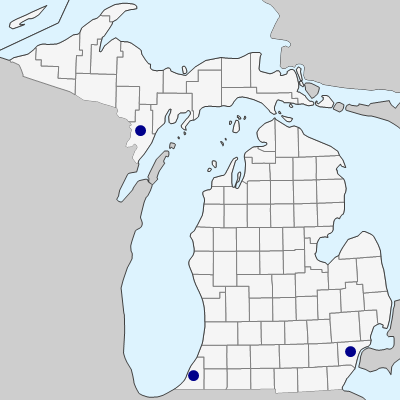 April 26, 2019. https://michiganflora.net/species.aspx?id=2351.